Triple C Charters: IT'S HOT! It's been a busy stretch for over the last couple weeks, fishing almost every day from Father's Day through the July 4th weekend. Lucky for us, the fishing has been just as hot as the weather. HOT!! 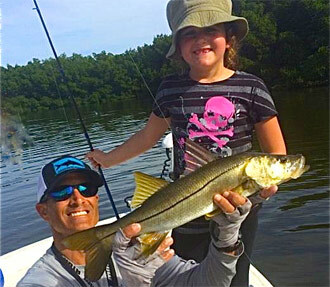 Anglers aboard "The Shear Pleasure" have had a great time pulling snook out of the mangroves and chasing tarpon around the bridges. 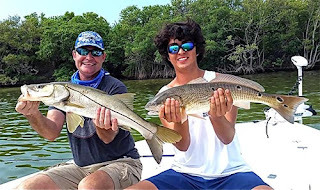 Inshore, the trout bite has been surprisingly consistent and we are finally getting some nice redfish, just not in the numbers we usually see this time of year. The spanish mackerel have been hit or miss but we have been catching a bunch of small, fun-sized sharks that make for some exciting battles on light tackle. Also an influx of mangrove snapper have made for some nice fillets for those wanting to take home some fresh fish. We've been beating the heat by starting early and even including a quick stop at the beach for lunch and a dip. 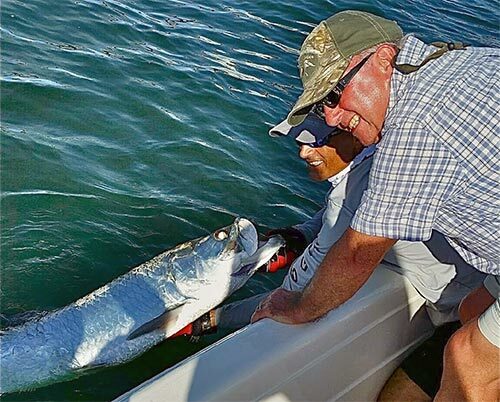 From the hard-core angler trying to land the fish of a lifetime to the absolute novice trying to catch the very first fish of their lives, Triple C Charters has the knowledge . . . and patience necessary to make these dreams a reality. Book a trip and come experience the great fishing we have, as well as, the natural beauty that surrounds us here. You'll be glad you did.